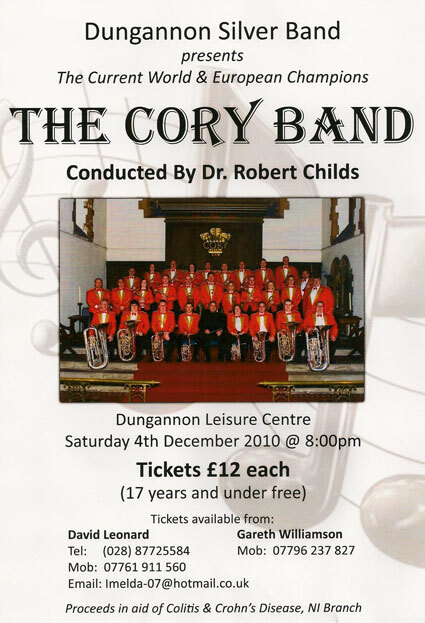 The current World and European Champions, The Cory Band, under the baton of Dr. Robert Childs will be in concert on Saturday 4th December 2010 at 8.00pm in Dungannon Leisure Centre. Tickets for what is sure to be a superb concert cost £12.00 each, however the concert is free to those aged 17 years and under. Tickets are available from David Leonard or Gareth Williamson (see the poster below for contact details) and the proceeds will be in aid of Colitis & Crohn's Disease, NI Branch. We urge you all to support this wonderful concert and thank Dungannon Silver Band for their efforts in hosting this event.